What made this launch different from the others? 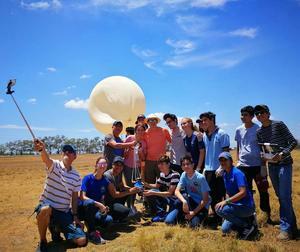 "We continued to improve the Data loggers and our use of the Iridium Satelite Network to track our capsule as it traveled into the stratosphere," says Diego, captain of the NSP Engineering team. In past launches the capsule launch has resulted in the capsule traveling east to west, however weather conditions presented a challenge as the capsule traveled west to east" explains Vivek, captain of the Physics team. Amad who is Hardware and Tech team captain shares that this launch is the 2nd time the team has 3d printed the capsule on site in ISP's tech lab. There was also progress on the experiments conducted on this launch. According to Patricio Science team captain, they prepared yeast cells to observe how they reacted to ultraviolet radiation in the stratosphere. Another important challenge the teams overcame was fitting their hardware and experiment into the capsule, as well as regulating the flow of electrical energy with the amount of data being logged, adds Diego. Although the team was not able to recover the capsule, they learned a great deal from the launch and are ready to make the necessary adjustments to hopefully launch one more mission at the end of May.